Oh please! Another great environmental scheme only to leave a huge carbon footprint like most of BIG's futile attempts to "harness", conserve, sustain and nurture, a gimmick as always, an empty gesture which ends up costing the environment more that it is worth. Sections are awful, nothing new there. Reminds me of Gardens by the Bay in Singapore: Flower Dome and Cloud Forest. Nice! Can't wait to see this coming to fruition. 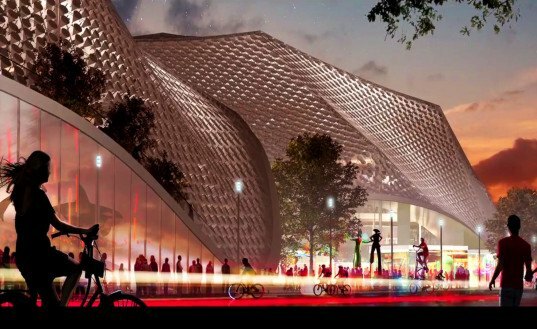 Earlier in the week, we brought you news that Heatherwick Studio and BIG are collaborating on the design of Google's new Mountain View campus. 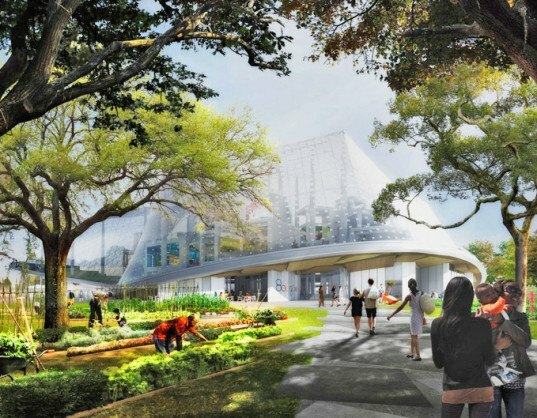 And now, Google has just published a video in which the two architecture stars discuss their plans for the upcoming Googleplex, and give a sneak peek at renderings for and models of what looks to be a stunning biosphere-filled utopia for the Silicon Valley giant. With both the public and employees using the campus, Heatherwick hopes that it will help Google to keep their feet on the ground. Among the hum-drum office buildings of Silicon Valley, the new Google campus is certain to make a striking presence on the skyline. 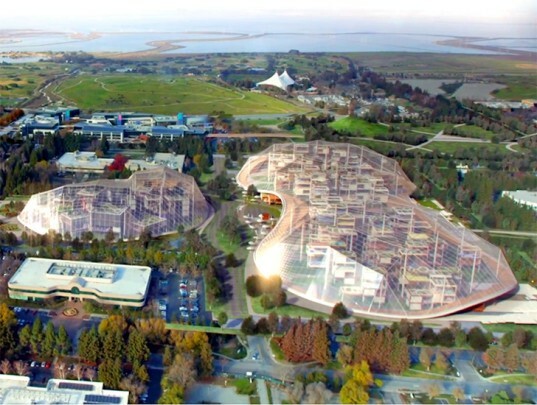 Google's video makes exceptionally clear that in hiring Ingels and Heatherwick, the search giant hopes to create a campus the likes of which haven't been seen before in Silicon Valley. As David Radcliffe of Google explains: "Tech hasn't really found its own language for building; we've just found old buildings and moved into them and we've made do the best we could." office buildings contained within large dome-shaped greenhouses and abundant plant life present both inside and out. The campus will be open to the public so as the local community can enjoy the open green spaces. The development will also include wildlife habitats and will restore waterways that feed water to the Bay. Ingels emphasizes that the campus "can't be a fortress that shuts away neighbors, that shuts away nature, it really has to be a neighborhood within Mountain View." Additionally, the new Googleplex will create an escape from the "parking lot" environment familiar to much of Silicon Valley. Roads will be designed for bikes and for pedestrians, with an urban environment that promotes a lively, stimulating energy. More details are still to come, and indeed more work is still to be done but Ingels is certainly correct when he says "[b]etween these three minds, these three companies working together, I'm dead certain we've come up with something that I don't think anyone of us would had we been working in isolation." 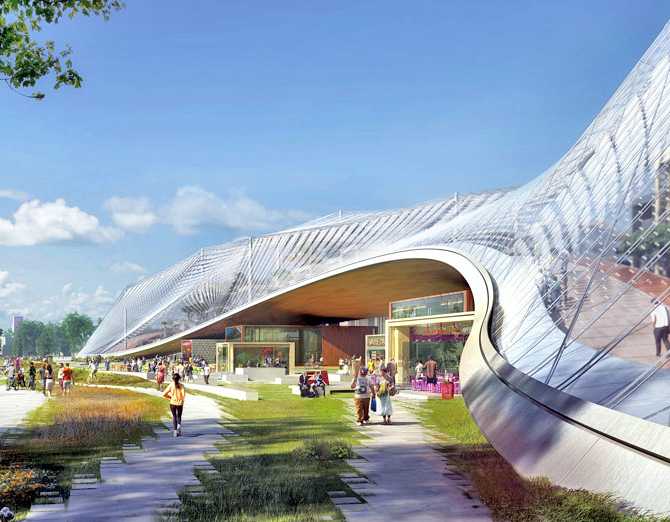 Earlier in the week, we brought you news that Heatherwick Studio and BIG are collaborating on the design of Google's new Mountain View campus. 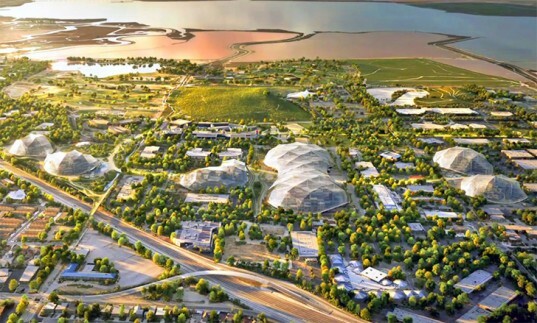 And now, Google has just published a video in which the two architecture stars discuss their plans for the upcoming Googleplex, and give a sneak peek at renderings for and models of what looks to be a stunning biosphere-filled utopia for the Silicon Valley giant.